When my husband left Monday morning for training, he was sick as a dog. He spent most of the evening in the bathroom and our Valentine's Day breakfast at home was canceled because he didn't have an appetite. I prayed that (three days later) he was hopefully feeling better. And thankfully, he was! However, I still had this need to serve him comfort food for dinner when he came home last night. 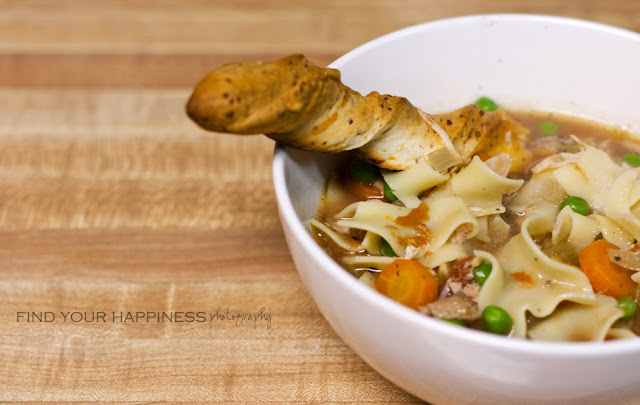 This recipe is based from the Betty Crocker Soups magazine edition but I made a few adjustments. I added more vegetables because Nathaniel loves and only eats veggies (do we have a little vegetarian in our hands?). I also added garlic because I think whenever onion is used, garlic should be, too (and we love garlic!). And since I only have the regular egg noodles in the pantry, I used those instead of the frozen home-style egg noodles that the recipe originally calls for. I just cooked the noodles separately and then added them 15 minutes right before serving. Spray 10-inch skillet with cooking spray; heat over medium heat. Cook chicken in skillet about 5 minutes, stirring frequently, until brown. 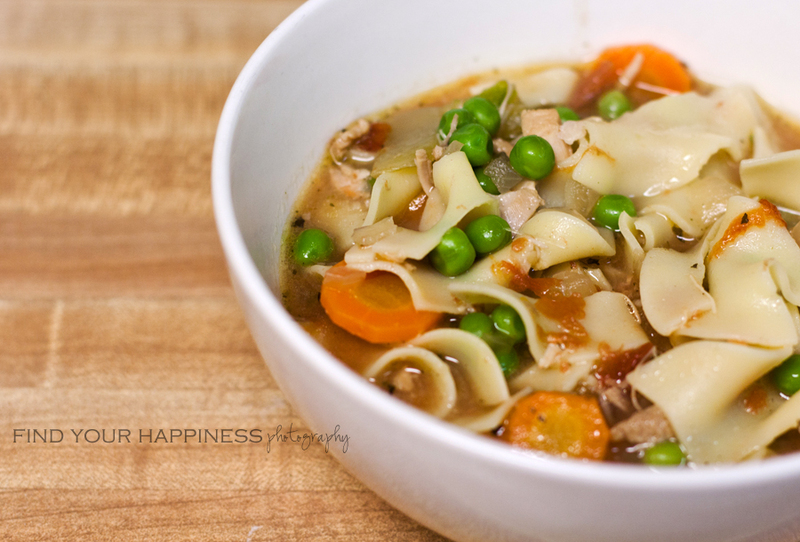 In 3 1/2- to 4-quarts slow cooker, mix chicken and remaining ingredients except peas and noodles. Cover; cook on Low heat setting 6 hours 30 minutes to 7 hours. Stir in peas and noodles. Increase heat setting to High. Cover; cook about 30 minutes or until noodles are tender. thanks for sharing, wishing you a sweet day. YUM! I'm going to try this! 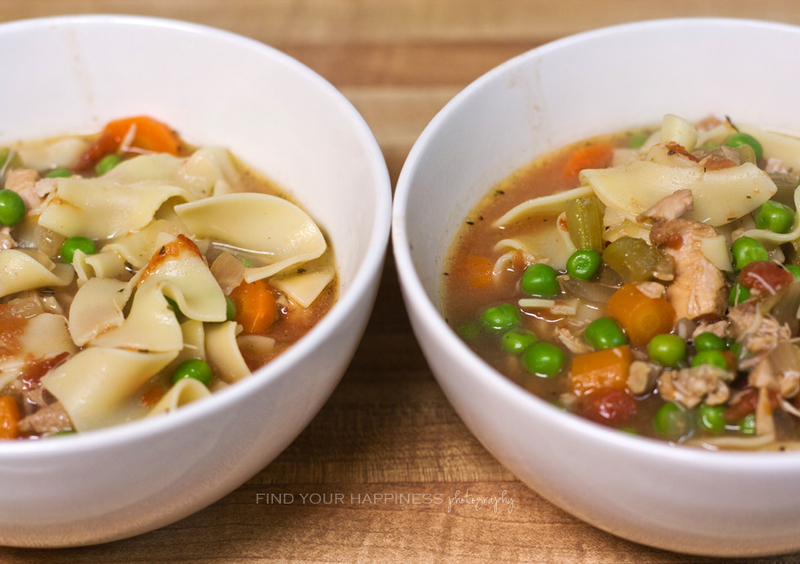 Love the photos and I am always looking for soup recipes, so thank you! I'm snagging this recipe! Lovely! This is a gorgeous soup! Thanks for sharing!!! I can't wait to try it out. Wow - that looks delicious! I found you through the "Weekend Wander" over at FTLOB. I am now following and I hope you'll follow me too! Thank you!